Southern Utah is world-famous for its spectacular landscape of sculpted canyons and buttes and hoodoos. There really isn’t anywhere else on the planet that packs so much eye-popping scenery into one, relatively small region. Fortunately, a great deal of that magnificent landscape can be easily visited on a bike tour, most of it along better quality, bike-friendly roads. No one-week tour could possibly hit all the great spots in the area, but this tour comes close. 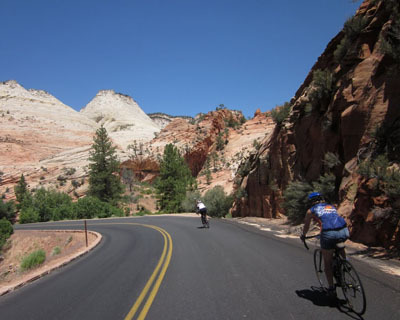 It visits Capitol Reef National Park, Grand Staircase-Escalante National Monument, Kodachrome Basin State Park, Bryce Canyon National Park, Cedar Breaks National Monument, and Zion National Park, plus all the miles of interesting bike roads in between. It’s a rich, varied sampling of just about every sort of geological extravagance the area has to offer. This tour can be made to work as a loop tour, given a little logistical gymnastics. Extra car pool cars can be left in the town of Cedar City for the week. (We stashed ours at a high school.) Cedar City is some distance from the start of the first stage and the end of the last stage. This means a few riders must either tack extra miles onto those two stages to “commute” to and from the stages, or it means a sag van—if you have such a thing—must shuttle those drivers/riders back and forth. A short, relatively easy stage with one long but gradual climb and an equal amount of long, gradual descending. Pleasant but not spectacular scenery. Overnight in a group site at a remote state park. Showers. More pleasant but unspectacular miles over much of the stage, but hugely spectacular near the end, as we reach the real red rock canyonlands in Capitol Reef National Park. Optional 12-mile add-on in park at the end of the stage…well worth doing. Overnight in beautiful group site in the center of the park (or in the standard campsite nearby). No showers. A challenging day with considerable climbing, including crossing 9400′ Roundup Flat summit. Stunningly beautiful scenery every mile of the stage, including on the optional leg at the start…not to be missed. An epic stage, as good as it ever gets. Overnight in pretty Calf Creek USFS camp in the Escalante-Grand Staircase National Monument. If you have the time and energy, finish the day with a hike to Calf Creek Falls, a 125′ spill into a perfect rock grotto…a dream swimming hole. Not as epic and spectacular as the previous stage, but still very interesting and a good bit easier. More rock garden fantasylands at the start, then a long, easy climb into pine and fir forest before descending into the stony canyonlands again. Overnight in beautiful Kodachrome Basin, a red-rock wonderland, off the beaten path for most tourists, so usually very quiet. Stay in the park’s lovely Oasis group site (or standard camp nearby). Showers. A short climb from Kodachrome Basin to the heart of magnificent Bryce Canyon, then lots of options: ride more miles in the park to visit the many scenic overlooks, or park the bike and hike down in among the colorful spires and hoodoos and arches that make the park so famous…or bike and hike both. Overnight in Sunset Campground. Showers nearby at park headquarters. Downhill from Bryce through picturesque Red Rock Canyon, then up, up, and up to impressive Cedar Breaks National Monument, well above 10,000′. (The climb is very long and the air is thin, but the grade is never steep.) Finally, descend for several fast miles to Duck Creek Lake. Overnight in the Wagon Train group site (or standard camp nearby). No showers, but the little lake is available. Downhill for many miles heading out of the high country and, eventually, into the bottom of Zion Canyon, one of the most magnificent natural wonders in the world. Easy or even thrilling downhill riding all day. Scenery in the first half is pleasant and in the second half is off the chart, stupendously grand. In addition to (or instead of) the out-&-back at the end, consider a hike in the dramatic Narrows of the Virgin River. Overnight at Watchman Campground in the national park. No showers. Or stay in lodgings in the town of Springdale, immediately adjacent to the park. A short, easy ride (intentionally so, allowing time and energy to retrieve the car pool fleet after the ride). Scenery is pleasant but not spectacular, except for the out-&-back at the end, which is as scenic and fun as anything else on the tour.